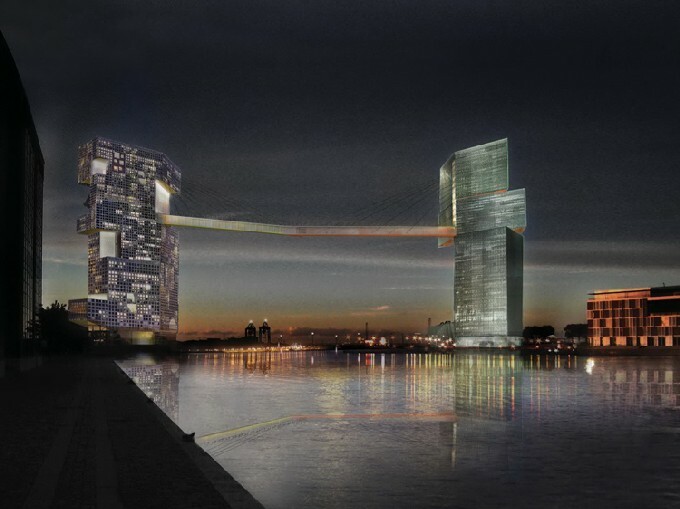 13 November 2015: The city is working with a new local plan for Steven Holl Architects’ project for two skyscrapers joined by a pedestrian bridge at the entrance to the historic harbor in Copenhagen. The design won the competition in October 2008 by a unanimous decision. Construction has been delayed by the economy, but is planned to start in 2016/17 if rental efforts are progressing satisfactorily. The design was honored by a Progressive Architecture Award in 2010. The design for the dramatic new harbor entrance to the great city of Copenhagen is based on a concept of two towers carrying two bridges at two orientations all connecting back to the unique aspects of the site’s history. The Langelinie site, a berth for ocean ships for decades, is expressed in the Langelinie tower, Gate L, with geometry taken from the site’s shape. A prow-like deck thrusts out to the sea horizon. Gate L is expected to be furnished with cafes and restaurants. The Marmormolen tower, Gate M, connects back to the City. Each tower carries its own cable-stay bridge between the two piers. Due to the site geometry, these bridges meet at an angle, joining like a handshake over the harbor. The soffits below the bridges and under the cantilevers pick up the bright colors of the harbor; container orange on the undersides of the Langelinie, bright yellow on the undersides of the Marmormolen. At night the uplights washing the colored aluminum reflect like paintings in the water. 14 november 2008: Ongelofelijk. Dit wordt de nieuwe toegang naar Copenhagen over het water. Twee hele duurzame kantoorgebouwen vol met zonnepanelen en daartussen op 65 meter hoogte een mooie loopbrug met de toepasselijke naam: Handshake. Het ontwerp is van Steven Holl Architects die er de international design competition The LM Project mee won. De torens staan respectievelijk op de Langenlinie Pier en de Marmormolen Pier. Zie het kaartje. Een mooi voorbeeld van duurzaam bouwen, duurzame energie opwekking in een architectonisch hoogstandje.